A lone fast boat has been spotted by equipment watching the coasts of Central Visayas, the only one unidentified among a fleet of commercial fishers, passenger ships and fastcrafts in the area. A tiny blip in the vast seas occupied by a screen full of codes for each blip except one, moving from to the north. Scramble in the Philippine Coast Guard (MRRV) Multi-role and rescue vessel to hail the suspect. One more potential threat off the water, but thanks mostly to a technology that the law enforcement and the PCG have at their disposal. Enter the Vessel Identification Network Tracking Application (VINTA) and Intensified Community Assistance Awareness Response and Enforcement (I-CARE), two web-based application and webpage that helps the PCG better serve the sea-faring public. VINTA and ICARE also allows the PCG to gain electronic records of all sea-going vessels, track them wherever they may be in high seas and send in help if they happen to be in distress. An enhancement of the usual pre-departure and clearing operations by the coast guard elements, instead of just visual checking of the ships logs and voyage documents, coast guard elements take digital snaps of these documents, and send them to the nearest station. In the station, an office personnel who keeps logs on violations, boat conditions, papers and documents compares these digitally snapped documents and fits them according to the checklist for a legal voyage. If the boat’s papers are in order, the station then sends the clearing message to release the boat for the trip. A previous violation or a non-compliance to sea-worthiness tests, franchise infarctions which has remained unsettled, can easily be seen and holds the boat to anchorage. These digital files are then kept, and a copy of such is passed to the port of destination where a similar coast guard personnel keeps logs. The clearing official sends to the corresponding personnel at the port of call the boat’s departure time, estimated time of travel, estimated time of arrival and trip details like ship captain, crew, passengers and cargo. Any delay in the trip can raise a red flag in the ICARE system, which allows the coast guard at port of destination to immediately dispatch rescue boats and the blinking image only stops as soon as the responding PCG team spots the boat, and leads it to port. Captain Gavan, however sees something more to this facilitated safety measure. “This allows us to have the big data which would help us in the dynamic analysis of all available information in our maritime domain,” the commander who came in after a decorated coast guard service in Zamboanga, his previous assignment. 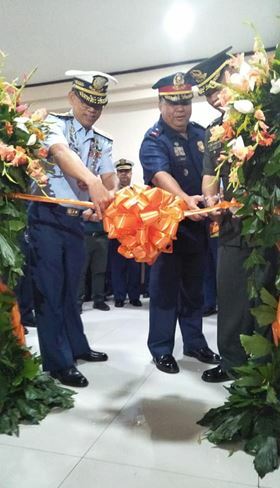 The launching of the VINTA and ICARE were just among the highlights of the 51st founding anniversary of the Philippine Coast Guard, November 7, 2018. Also opened to the public especially for their stakeholders was the Lapulapu Hall in the third floor of the District Headquarters at Pier 3 in Arellano Street, Cebu City. From sea rescue in their areas of responsibility in Central Visayas, the PCG has also been instrumental in keeping coastline security and maritime patrol operations, vessel fire rescue to search for survivors in the Naga landslide. True to its mandates, the PCG has led in the enforcing of laws within Philippine waters, conducting maritime security operations, safeguarding life and property at sea, and protecting marine environment. 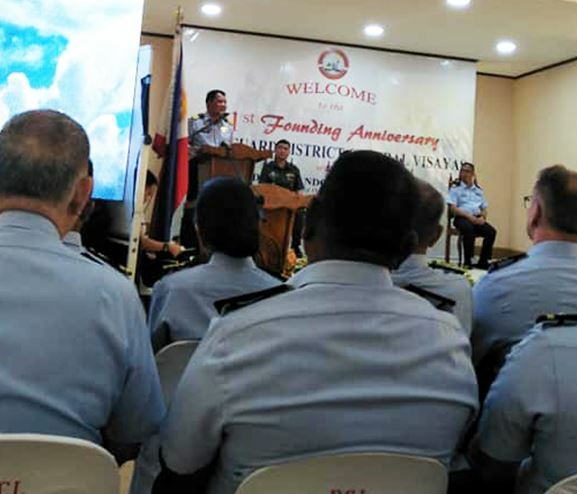 The coast guard also had Deputy Commandant Rear Admiral Rolando Legaspi as keynote speaker leading the guests that included agency partners and maritime stakeholders and its most active coast guard auxiliary units across the region.